4 Piece Cable Management Kit for Extension: RC-CBM-EXT-KIT | Altus, Inc.
Triangle of care. Caregiver and patient interaction is of most importance for patient satisfaction. 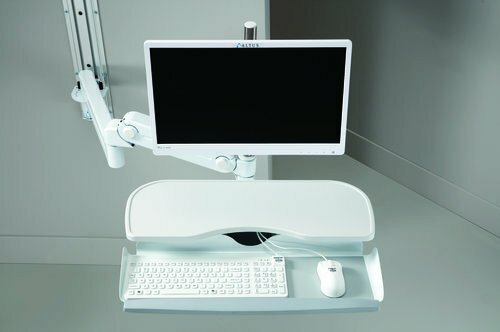 Direct contact between the caregiver, patient and monitor is possible with Reach, Altus’ wall mounted workstation. Extended Reach. The 4-piece kit allows an extension of up to 59” from the wall. And stored 10” when against the wall. Great for small medical rooms.